I ship Blamega! Or Omaze! 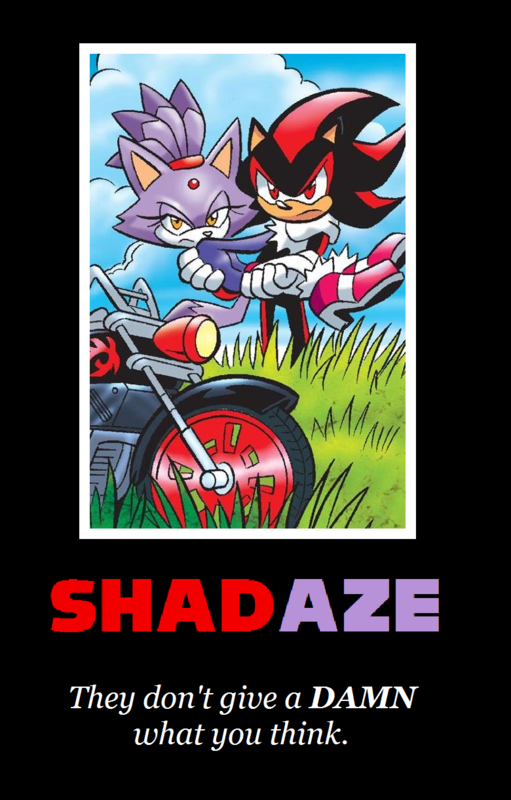 (Blaze and Omega) :3 (and Shadouge and Silvaze... sorta.) Ehheh. But yeah I can see why they're being shipped... Though I always like to see some opposite pairings. Oddly enough, I can understand THAT pairing, too. "I like you. Let's burn stuff together!" I know right? It was just so cute! Not half as cute as Omega's treatment of Cream and Cheese. how he was afraid he would "pop them." I kind of ship Tails and Blaze and Sonic and Blaze. Tails and Blaze because of Tails mentality to like older women (at least in the comics) and his sweetness that would sort of cool down Blaze. Sonic and Blaze because of the ship hints in games like Rush and black knight and them begin the same in each of their universes/zones. So, that IS a real thing. I wasn't just having a bad dream, and imagined it.